Perfect flowers for a perfect day! Emily was amazing to work with and the flowers were absolutely beautiful and exactly what we wanted! I chose her at random to work with me long distance for our Lake Erie wedding and I’m so glad I found her. We could not have been happier with the whole experience. Emily was a pleasure to work with. She responded quickly and checked in closer to the wedding date to review all the details. The bouquets she put together were beautiful and exactly what I asked for. 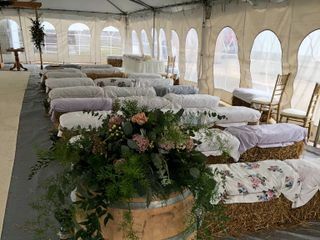 I would highly recommend choosing to get your wedding flowers from Bailey's! Emily was great to work with. She made sure to accommodate everything I had wanted and envisioned for my special day. The flowers looked amazing. Highly recommend her. Emily was fantastic to work with! She answered all of my questions once, if not two or three times. She was always quick to respond to my texts, e-mails, and phone calls. She gave me suggestions on the types of flowers to use based on the kind of wedding theme/look we were going for. I would highly recommend her business to any one - near or far! Not only was she very professional, but she also created the most beautiful flowers for myself, my bridesmaids, and our parents! 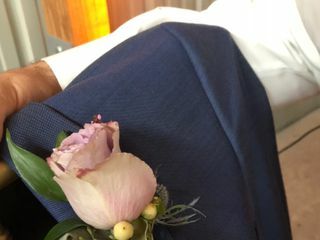 The only thing I regret is that I was not aware that you could preserve your bouquet through a different company that a former bride recommended. After finding this out, I am actually thinking about having her make me another replicate of my bouquet so that I can preserve this memory for years to come! Emily at Bailey's Buds 'n Blooms was wonderful to work with. The flowers were perfect and everything was better than expected. I would highly recommend Emily for all your flower arrangement needs. Emily is and was absolutely amazing to work with. 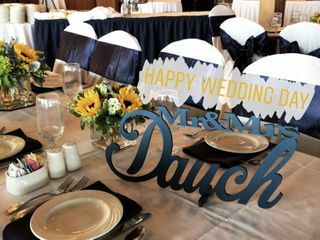 If you are unsure exactly what you want, she has awesome ideas and is very good at helping you and in trying to figure out what you want to make your event beautiful. 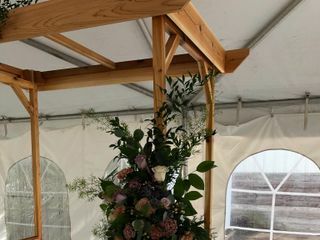 I went in not knowing for sure what flowers I wanted except for a few, and she put together amazing arrangements for our centerpieces, bouquets, pew flowers, and so much more. I highly recommend Bailey's Buds 'n Blooms to any one for any occasion you need flowers and decor for!!! Emily was awesome to work with! She was super friendly and had lots of great ideas/suggestions. Our flowers turned out even more beautiful than I expected!!! I would definitely recommend Emily at Bailey's Buds n Blooms. Emily was AMAZING to work with. I live over 8 hours away from my venue and Emily. However, Emily went above and beyond to make the planning process simple. I sent her a few pictures of my vision and she quickly responded with various options. Emily understood my vision and everything turned out just as I dreamed it would. Emily was extremely responsive and professional. All I can say is I wish I lived closer so that l could use her services again! Everything was great! The flowers and centerpieces were beautiful; they were exactly what I had pictured. Emily was wonderful and had lots of great ideas. She was so helpful and easy to work with! Emily was fantastic! She did exactly what I asked for and was always responsive to all my emails and she even worked within my budget! Bailey's Buds and Blooms were THE BEST FLORIST I've ever worked with. Bailey's valued the importance of my parents' 50th wedding celebration, they valued my time, they valued my vision, and they valued my wallet. I'm a stickler for exceptional customer service - and they delivered! 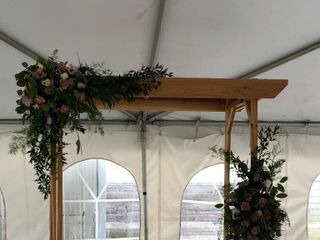 Emily did an amazing job on my wedding flowers! She was able to take all of my ideas and create the perfect floral arrangements that complimented our wedding theme. I would highly recommend her! Emily is so so easy to work with! I really didn't have much of an idea of what I wanted for my flowers yet she somehow made them exactly like I had imagined with the couple of ideas I threw at her. I received so many compliments on my bouquet and my bridesmaids' bouquets. Multiple people told me they were the prettiest flowers they had even seen at a wedding. I highly recommend Bailey's Buds n Blooms! The flowers/centerpieces were absolutely beautiful. The were designed perfectly for us and our wedding. It really enhanced the beauty of the day!! Would absolutely recommend them for not only weddings but everyday floral arrangements and other events! 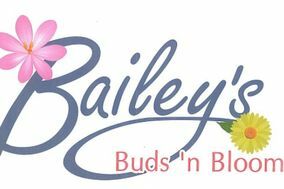 Bailey's Buds n Blooms was great to work with, I was about an hour away and they were extremely flexible. They were a great help and everything looked great! I Highly Recommend ! We chose Emily primarily because she is a friend of the family and we had seen a couple friends have stunning work done by her as well. After seeing some samples on display at a Bridal Show, we decided then and there it would be her. When family and friends asked what our “theme” was, I was confused because I didn’t know they needed themes; but, if there were a few words I would choose to describe my overall feel they would be romantic, flowers, and burgundy. With that said, I wanted as many flowers as I could, everywhere I could. Emily was very good with offering options that we could move around and work around to get what we really wanted within our budget. 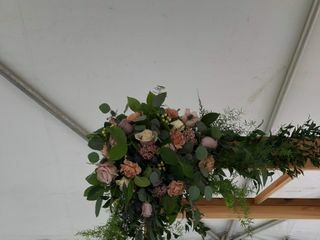 I even had several artificial flowers in my bouquet and centerpieces because they were out of season, but you couldn’t tell at all. The arrangements and bouquets were unique and stunning, as all her work is. I’m known for being extremely particular… and if this bothered Emily, I never saw it 😊. It was difficult to trust someone with such an important day and make sure they match the vision in your head. I plan on ordering from her at every chance in the future and would recommend her wholeheartedly. 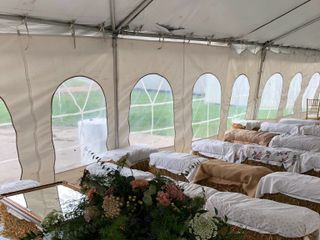 We ordered wedding party flowers, family flowers, pew arrangements, altar arrangements, and centerpieces for 20 tables.